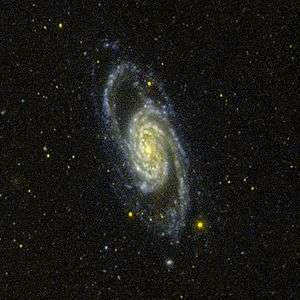 A barred spiral galaxy is a spiral galaxy with a central bar-shaped structure composed of stars. Bars are found in approximately two-thirds of all spiral galaxies. Bars generally affect both the motions of stars and interstellar gas within spiral galaxies and can affect spiral arms as well. 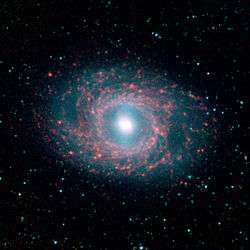 The Milky Way Galaxy, where our own Solar System is located, is classified as a barred spiral galaxy. Barred galaxies are apparently predominant, with surveys showing that up to two-thirds of all spiral galaxies contain a bar. The current hypothesis is that the bar structure acts as a type of stellar nursery, fueling star birth at their centers. The bar is thought to act as a mechanism that channels gas inwards from the spiral arms through orbital resonance, in effect funneling the flow to create new stars. 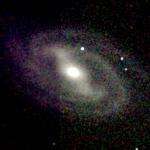 This process is also thought to explain why many barred spiral galaxies have active galactic nuclei, such as that seen in the Southern Pinwheel Galaxy. The creation of the bar is generally thought to be the result of a density wave radiating from the center of the galaxy whose effects reshape the orbits of the inner stars. This effect builds over time to stars orbiting further out, which creates a self-perpetuating bar structure. Bars are thought to be temporary phenomena in the lives of spiral galaxies; the bar structures decay over time, transforming galaxies from barred spirals to more "regular" spiral patterns. Past a certain size the accumulated mass of the bar compromises the stability of the overall bar structure. 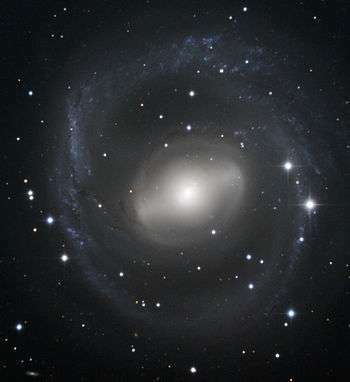 Barred spiral galaxies with high mass accumulated in their center tend to have short, stubby bars. Since so many spiral galaxies have bar structures, it is likely that they are recurring phenomena in spiral galaxy development. The oscillating evolutionary cycle from spiral galaxy to barred spiral galaxy is thought to take on the average about two billion years. Recent studies have confirmed the idea that bars are a sign of galaxies reaching full maturity as the "formative years" end. A team led by Kartik Sheth of the Spitzer Science Center at the California Institute of Technology in Pasadena discovered that only 20 percent of the spiral galaxies in the distant past possessed bars, compared with nearly 70 percent of their modern counterparts. Milky Way Galaxy spiral arms - based on WISE data. The general classification is "SB" (spiral barred). The sub-categories are based on how open or tight the arms of the spiral are. SBa types feature tightly bound arms. SBc types are at the other extreme and have loosely bound arms. SBb galaxies lie in between. SBm describes somewhat irregular barred spirals. 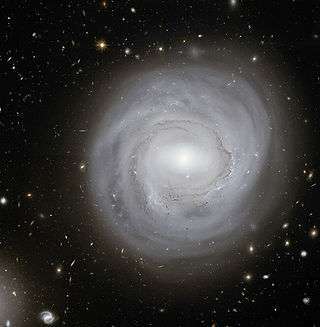 SB0 is a barred lenticular galaxy. Wikimedia Commons has media related to Barred spiral galaxies. Britt, Robert Roy. "Milky Way’s Central Structure Seen with Fresh Clarity." SPACE.com 16 August 2005. Devitt, Terry. "Galactic survey reveals a new look for the Milky Way." 16 August 2005. 'Barred' Spiral Galaxy Pic Highlights Stellar Birth." SPACE.com 2 March 2001. Hastings, George and Jane Hastings. Classifying Galaxies: Barred Spirals, 1995. "Astronomers Find Multiple Generations of Star Formation in Central Starburst Ring of a Barred Spiral Galaxy." January 15, 2000. Barred spirals come and go Sky & Telescope April 2002. "ESO Provides An Infrared Portrait of the Barred Spiral Galaxy Messier 83." November 29, 2001. A press release from the European Southern Observatory. Horton, Adam. 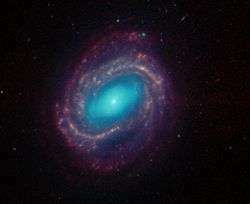 "Spitzer NGC 1291 barred spiral galaxy seen in infrared." 22 October 2014. 1 2 D. Mihalas (1968). Galactic Astronomy. W. H. Freeman. ISBN 978-0-7167-0326-6. ↑ P. B. Eskridge; J. A. Frogel (1999). "What is the True Fraction of Barred Spiral Galaxies?". Astrophysics and Space Science. 269/270: 427–430. Bibcode:1999Ap&SS.269..427E. doi:10.1023/A:1017025820201. ↑ J. H. Knapen; D. Pérez-Ramírez; S. Laine (2002). 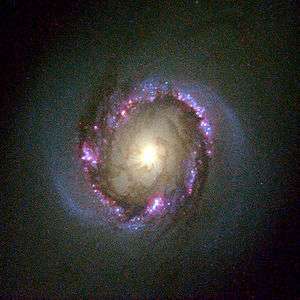 "Circumnuclear regions in barred spiral galaxies - II. Relations to host galaxies". Monthly Notices of the Royal Astronomical Society. 337 (3): 808–828. arXiv:astro-ph/0207258 . Bibcode:2002MNRAS.337..808K. doi:10.1046/j.1365-8711.2002.05840.x. ↑ F. Bournaud; F. Combes (2002). "Gas accretion on spiral galaxies: Bar formation and renewal". Astronomy and Astrophysics. 392 (1): 83–102. arXiv:astro-ph/0206273 . Bibcode:2002A&A...392...83B. doi:10.1051/0004-6361:20020920. 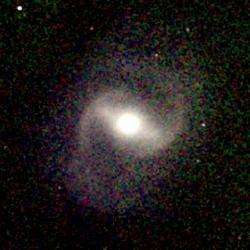 ↑ Barred Spiral Galaxies are Latecomers to the Universe Newswise, Retrieved on July 29, 2008.